Jordi Botifoll Cisco President Latin America & Senior Vice President in the Americas, Cisco Inc.
We live in the age of digitization. Digital tablets are replacing books, we get our news from RSS feeds instead of newspapers, “records” are being released as MP3s, and cars will soon be driving themselves. Yet at the same time, many people do not have enough food to eat, reliable medical care, or an adequate education. In fact, studies show that over 250 million children of fourth and fifth-grade age are not able to read, write, or do basic math. In Latin America the education gap is very prevalent, with the majority of children in Latin America not receiving a high-quality, relevant education. According to the Worldfund, approximately 22.2 million children and adolescents in Latin America are not in school, or are at risk of dropping out of school each year. As a result, too many Latin American youth entering the labor force lack the skills necessary to find dignified work and participate in an increasingly competitive, information-rich and globalized economy. The most important competitive asset Latin America has is its youth. Using technology to digitize education across this region will lead to further innovation, social inclusion, job creation and national competitiveness. According to industry analysts, there are already 150,000 information and technology (ICT) jobs that are unfilled because there are no qualified workers to fill them. At the same time, jobs that require unskilled, manual labor are quickly being replaced by automation. In order to succeed, Latin Americans need to learn new job skills and competences such as critical thinking. Learning to speak English is another skill Latin Americans must master, however, the country has a lack of qualified English teachers, let alone teachers who can pass on the technical skills that are most needed in this new digital economy. The Internet provides a unique opportunity to solve classroom challenges and improve education, the School Connectivity for the 21st Century found. The digitization of education has the power to give students the skills they need to generate a more prepared workforce, create jobs, and ultimately make Latin American companies more competitive in a global marketplace. However, Latin America lacks the connectivity infrastructure of other regions. According to the 2015 Global Information Technology Report, in a measure of 143 countries based on the use and impact of information and communication technologies, the highest ranking Latin American country is Chile, at position 38. A classroom in a rural town in Uruguay where teachers from across the world appear on video screens to teach perfect English. A former gang member in Mexico who learns computer networking skills and starts his own lucrative consulting company. A woman in Costa Rica who can finally feed her family because the market for her tiny craft business has been vastly expanded through a website. It’s all happening. And Internet access is making it possible. 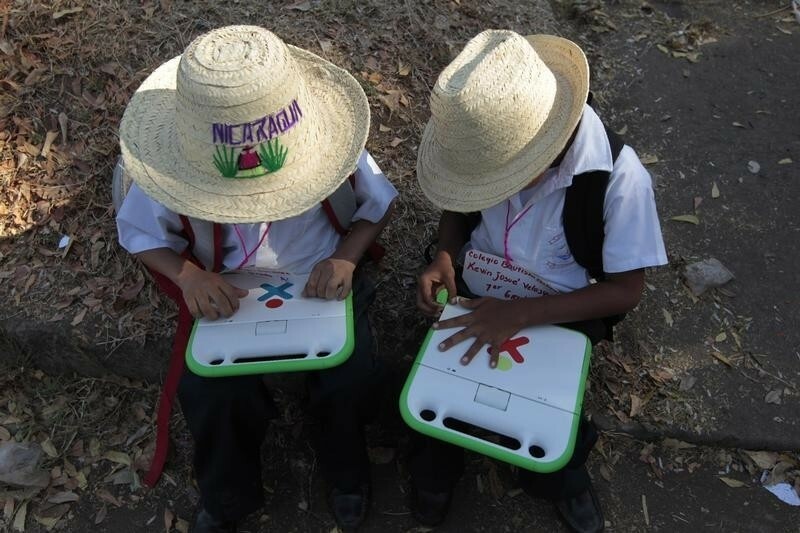 Schoolchildren use their XO laptops at the Municipal Stadium in Ciudad Sandino, on the outskirts of Managua, April 4, 2013. Cisco recently announced a partnership with the Latin American Development Bank CAF and the United Nations Economic Commission for Latin America and the Caribbean (CEPAL), with the goal of improving the quality of education in Latin America by connecting all classrooms to the Internet. Plan Ceibal, a Uruguayan initiative to digitize education in Uruguay, is making good progress in this area. Before the program, 43% of primary schools in the country did not have a computer. If they did, it was much more likely to appear in a wealthy, private school. Low-income public schools averaged one PC per 78 students. Through Plan Ceibal, Uruguay became one of the first countries in the world to provide a laptop to every primary school student. But a laptop is not very useful without Internet connectivity. Plan Ceibal’s program also brings expert English teachers into the classroom via video. Now almost 80,000 students in Uruguay are learning English through this video conferencing system. There are similar initiatives happening all across Latin America. The Teacher’s College from the Secretary of Education in Sao Paulo, Brazil is another great example of how digitization has transformed the process of training teachers. Through connectivity, video and collaboration on a network infrastructure, over 270,000 public school teachers were trained – contributing to significant improvements in the overall quality of education across this state. But someone needs to build and maintain this new network. Through the Cisco Networking Academy, more than 5.5 million students have participated in ICT courses and become a force for change in the global economy. The Academy has also given 1 million students from over 30 countries in Latin America the skills they need to fill jobs that are in demand. Academy students are not only learning how to build, operate, manage, and troubleshoot networks, they are learning about hot topics such as cybersecurity and the Internet of Things (IoT). Some are also learning how to market and charge for their services, so that when they graduate, they can jump right into the workforce, and be successful. The Academy’s curriculum, free to universities, colleges, and high schools, has continued to evolve over the past 19 years, as research organizations like the Gartner Group help to identify the most needed and saleable skills, as well as what the workforce of tomorrow will look like. The Academy is working. 95% of students who have completed the Academy’s CCNA, CCNP, or higher-level courses, have obtained a job or gone on to higher education. 78% have obtained a job opportunity, and 54% got a new job as a result of the skills acquired through the program. Ask Daniel, of Mexico City, who began using drugs when he was 14 and dropped out of school. He learned about the Cisco Networking Academy through a drug rehabilitation center for youth, where 300 patients and their relatives completed the program between 2008 and 2015. With his new skills, Daniel was able to open a computer repair workshop, and he returned to school to study math and engineering. Or Luis, who was expelled from school after getting involved with a gang. He was working a minimum-wage job at a local park when he found out about a local program that combines Cisco Networking Academy coursework with entrepreneurship training. The partnership between Cisco, the United States Agency for International Development (USAID), World Learning, and the Mexican Secretariat of Public Education supports at-risk youth as it increases the number of skilled workers in Northern Mexico. After he graduated from the program, Luis started his own networking support company. He grew his business and hired other students from the same program. He and his employees are making significantly more than minimum wage. And they’re staying out of trouble. Boys like Luis and Daniel are the face of Latin America’s future. As Internet connectivity and digitized education become more prevalent, the future will get brighter and brighter not just for the youth, but for all of the people in this great region. Jordi Botifoll, Cisco President Latin America & Senior Vice President in the Americas, Cisco Inc.